If you want to get to the top of the career ladder, you need to build your brand! Being in the staffing industry, I’ve interviewed hundreds of people and am amazed by how many people tell me they want my job straight out of high school or college with no experience and no reputation. They don’t want to start entry level, they want to immediately be in an executive role. My job took time, preparation, an enormous amount of learning and personal growth, on top of countless hours spent training to be the best. A huge part of my success has been branding. Through building my brand, I have grown my company in double digits, become a recognized expert and leader, built a reputable business, and have more business approaching me than the reverse(and trust me, it took years to get to this point). Building your brand is not easy, but if you put in the work each day, it will pay off. Here are my top 5 lessons on branding yourself to the top. Be the best at something! What do you want to be known for? 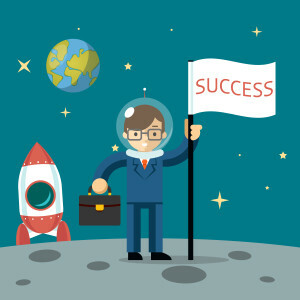 Is the sale guru, is it SEO expert, or the super connector? To be recognized as an expert, you need to have accolades, testimonials, aka evidence that you are in fact an expert. You need to have your network constantly being your brand ambassador. In order to be the best, you need to know that subject inside and out. Do your homework. Become the go-to-person! Create your own website! People will search for you and you need a place for them to find you. This is also a great place to showcase your brand, catalog special certifications you collect, and continue building credibility. Once your website is created, you can share it with everyone. The key is to build your mailing list so you can begin to grow your network and build a recognizable brand. Network! Nothing beats face-to-face interaction. Relationships are the bread and butter of success. The more connected you are, the more resources you will have access to and the easier success will be. Start by becoming a leader in your local community — join the local Chamber of Commerce, join the board of a local nonprofit organization. Make a point to get connected and stay connected. Everyone knows someone. Word of mouth is the fastest and easiest way to build your business, brand and bank account! Use social media. If you want it now, social media will get you there sooner than later. Start by mastering a social media account. My recommendation is LinkedIn. Give yourself a goal to add 25 thought leaders in your community each day. Once added, make contact with them. Do no sell to them, but simply ask them what you can do for them. Be strategic. Post blogs that give your audience solid advice, write content that shows you’re a thought leader, and connect with others. Start small, and keep improving. Blogging is the best way to begin to build credibility and recognition. Speak! Take small gigs at chamber events or non-profit organizations. Everyone is looking for free speakers. You’ve got to start somewhere, so choose a few possibilities and offer to speak for free. Keep track of the engagements you’ve spoken at. During your presentations, you can offer free items on your website once they subscribe. Everything you do needs to funnel back to your website to build that mailing list. It may not seem like you’re getting anywhere, even for long periods of time. You may experience the “lightning strike” of quick success, but don’t count on it! Work a little bit every day toward establishing yourself as an authoritative expert at what you’ve chosen, and let your brand build. Take a lesson from the Golden State Warriors! Success does not come overnight. It is earned through time, hard work, dedication, and commitment to excellence.